Korolev is a Project 775M Large Landing Ship (LLS). The ship was laid down on February 12, 1990 at Gdansk shipyard (Poland) under the name of BDK-61; launched on November 16, 1990; commissioned on January 5, 1992. The ship was renamed into Korolev on December 28, 1999. Since March 23, 1992 till September 19, 1994 the ship took part in withdrawal of Russian military contingent from Baltic countries and Poland. 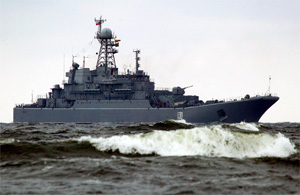 In 1994 and 1995 it participated in St. Petersburg naval parade associated with Russian Navy Day. In 1995 the ship represented Russia at international naval parade of anti-Nazi allies held in Netherlands in honor of 50th anniversary of the Victory in WW2. In 1995, 1996, 1997, 1998, 1999 being a part of landing craft division, it won Navy Commander's Prize for landing assault. In 1992-1999 it was ranked as the best ship of BF 71st landing craft brigade for combat training and military discipline.